Genuine Blackhawk! Brand Omega Vest in black. This example has been stripped down by the previous user, to create a lightweight, low profile ammunition carrier. 3 x ammunition pouch in Cordura, sewn directly to a mesh base for maximum breathability and minimum weight. Each pouch will accommodate 2x 30 round 5.56mm magazines, or 1x AK type 30 round, AK magazines shown. 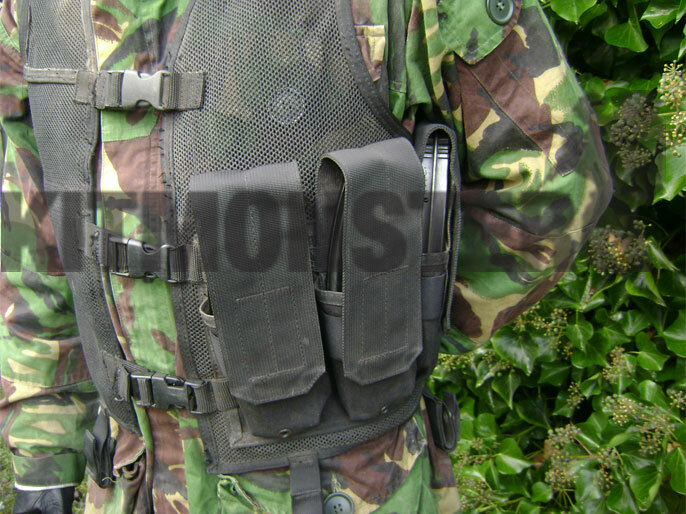 Ammo pouches all close with removable, height adjustable, Velcro flaps. Each pouch has a wide elastic compression strap to eliminate rattle and a drainage eyelet in the base. All other external pouches, pads and most fittings have been carefully removed. Closes with 3 x QR buckle, cord fittings on sides to adjust size. Please note this is larger in size than the Omega Vests usually found in the UK. 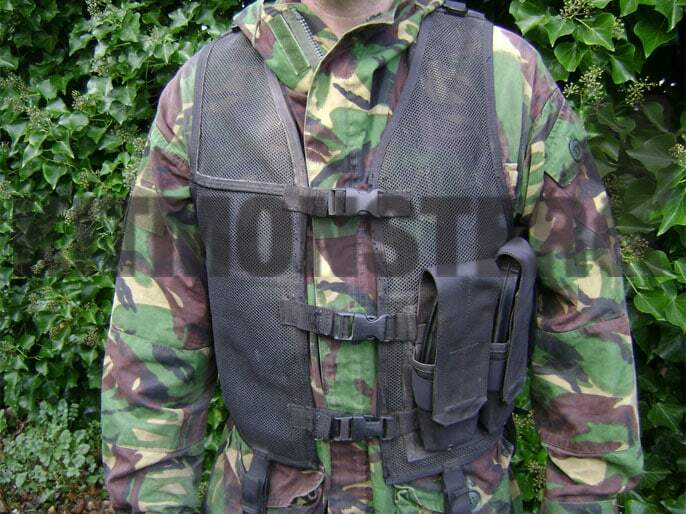 Most UK Omega stock is size 3, this vest is size 5. This may be too large for slimmer users without armour, but is generous enough to fit over most armour systems. Press Studded belt loops on lower hem allows fitting of a pistol belt with additional pouches if required (belt not included). 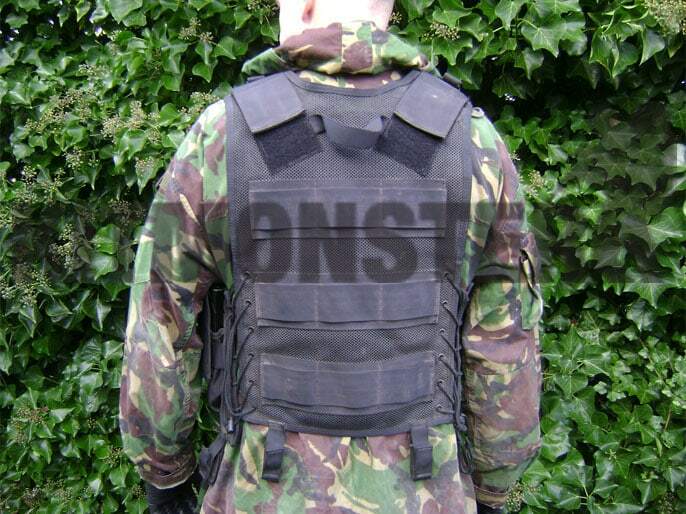 Grab/drag handle on back, plus horizontal strap fittings for additional pouches, MOLLE & ALICE compatible. D ring, and Velcro panel on each shoulder, for cable or hose routing. 2 zipped internal pockets for maps and documents, these measure approximately 21 x 27cm. Internal mesh in back panel for hydration bladder. Dusty in places, this item looks to have led an interesting life, we'd like to know the history on this one. Obviously used but in good condition, no damage and with plenty of use left in it. 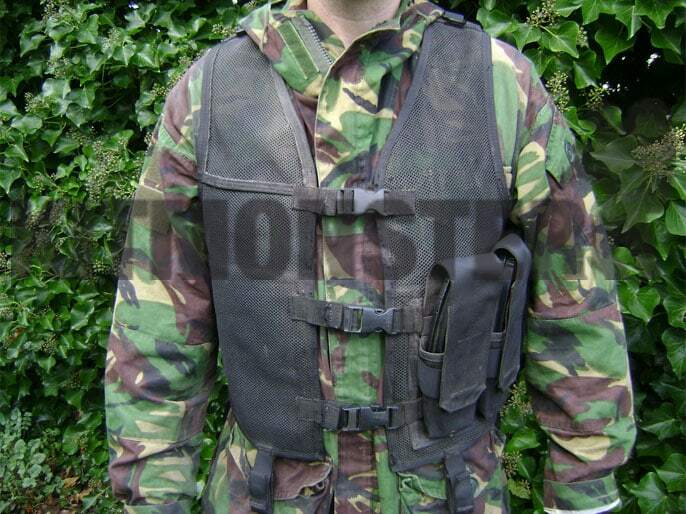 Multiple views shown, all contents for illustration, single empty vest supplied.